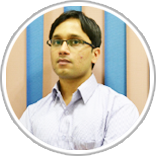 Ashish Kumar, Graduate of IIT Roorkee 2009 batch popularly known as the master of Physics because of his passion of teaching physics with the help of his vast knowledge and experience. After graduating from IIT Roorkie, he continued his passion towards teaching and joined Askiitians to help IIT JEE aspirants to fulfill their IIT JEE dream by his depth knowledge of teaching. Teaching was there in his blood from childhood when he was in 12 std. started to coach his juniors. Then after cracking IIT he started to coach the local kids of Roorkie who are far away from adequate facilities of Kota for IIT JEE dream. Not only a huge number of students have cracked IIT JEE but lots of students have scored 100 out of 100 in physics in their board exams under his guidance. Ashish sir's classes are always interesting. What ever he explains I understand it very well.